Here’s a little gallery of some of the tasty food we spotted and/or enjoyed on a trip to Kyoto and Nara in March. Tofu shop at Nishiki Market – wish I could have taken some home! A few months back, hubby and I went on a short trip westward on the pretext of him presenting at a conference in Kyoto. 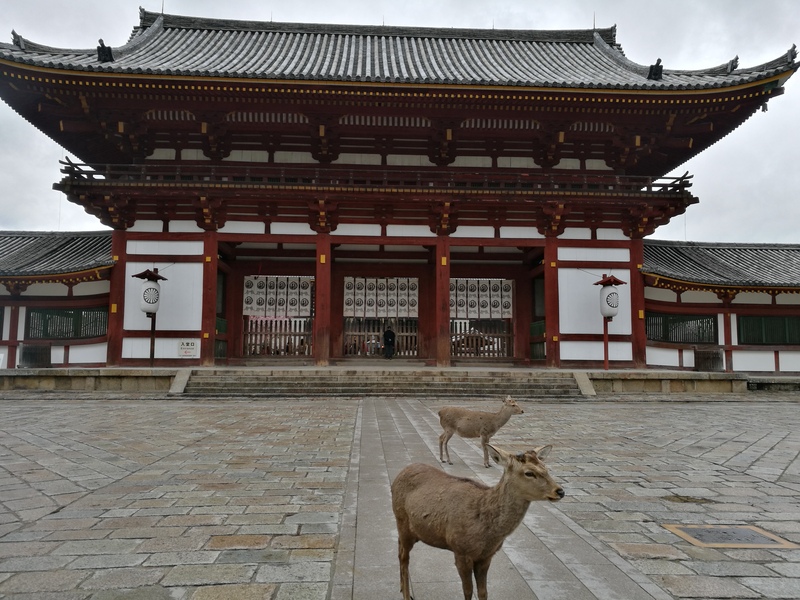 We stayed in that city for two nights, and then we headed to Nara for a few more days of fun. Kyoto is a spectacular jewel of Japanese culture and history, but it is also overrun with tourists. Nara has a much quieter vibe with several major historical sites (and more Japanese tourists compared with foreign). Nara city, in Nara prefecture, was the imperial capital of Japan from 710 to 794 (that is, the Nara Period). Prior to that, from 538 to 710, the capital was Asuka, also in Nara prefecture. So, there is a lot of really old stuff in the area. 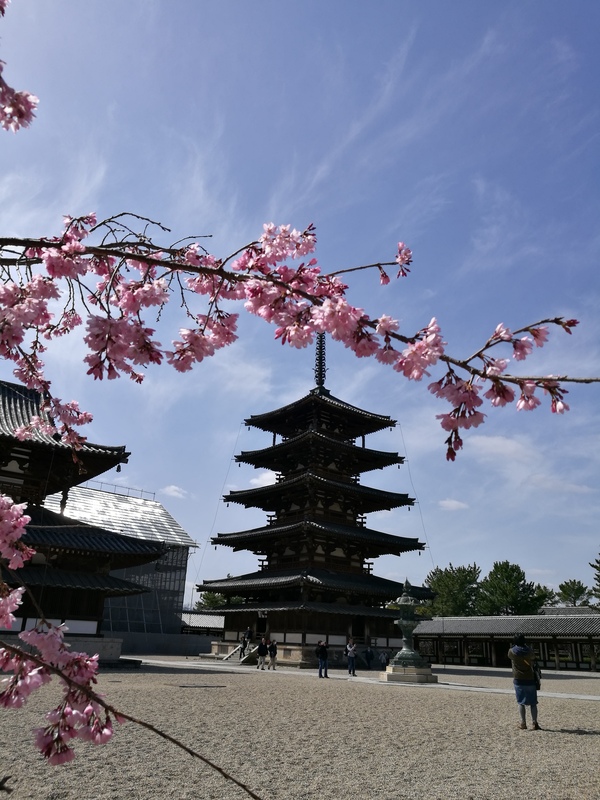 If you’re planning a trip to Nara city, you definitely shouldn’t miss the top attractions: Tōdai-ji temple (including the Great Buddha), Kasuga Shrine, Kōfuku-ji temple + museum, and the Nara National Museum. If you visit any of these, you will also encounter the iconic deer of Nara roaming freely and happy to relieve you of senbei (rice crackers) that you can purchase to feed them. I could write lots more about Nara (and intend to…eventually…) but for now, I want to point out the wonderful Hōryū-ji (法隆寺), a temple located in a town called Ikaruga. From Nara city, it takes about 20 minutes by train and another 20 minutes or so to walk to the temple complex. Hōryū-ji was one of the first places in Japan made a UNESCO world heritage site. One big draw is the 5-story pagoda, which is the oldest known surviving wooden building in the world, built in 607. The temple features several other magnificent buildings from the Nara period and beyond, including the Gallery of Temple Treasures—a hall that displays sculptures and other Buddhist artwork, several of which are national treasures. As at many other sites in Nara, I was interested to see the evolution of Buddhist art from the original introduction of the religion in Japan in the Nara period, where it was distinctly Indian and later Chinese in its aesthetic, to the gradual “Japanization” of the figures depicted in sculpture and paintings. Aside from the awe-inspiring historical structures and art, I was really struck by a smaller round building on a hill at the edge of the grounds. Called Saiendo, it houses a Yakushi Nyorai or healing Buddha. The building is accessible to anyone without paying the main temple entrance fee, and during our visit we saw several people who appeared to just live in the community make their way up the steep steps to pray and receive a healing blessing from the temple. It’s remarkable that a place that’s so old is still a part of many people’s everyday spiritual practice. 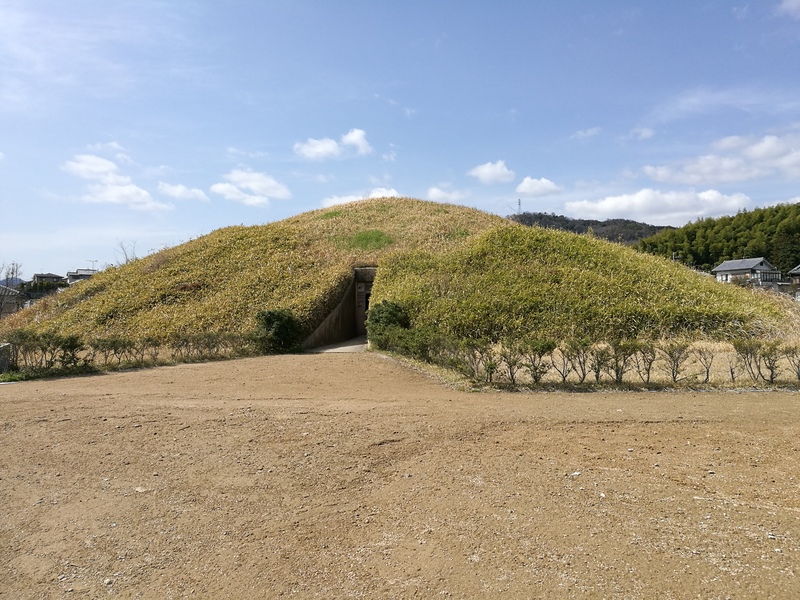 One last site to mention near Hōryū-ji is the Fujinoki Kofun (that is, tumulus or tomb) (藤ノ木古墳). It’s a burial mound that is believed to be from the late 6th century and was apparently untouched until an archaeological excavation in 1985. I’m still baffled as to why the tomb wasn’t looted at some point in the last 1,400 years, but it’s speculated that the site was under the protection of the Buddhist authorities at Hōryū-ji, so no one was brave enough to touch it. At any rate, the tomb’s excavation revealed amazing and unique artefacts of the era. It seems that two wealthy and powerful young men were buried there, along with ceremonial martial gear including swords and war horse ornaments, decorative clothing, jewelry, etc. Many of the items seem to have come from Korea or were somehow created in a Korean style, prompting lots of speculation about trade and travels in East Asia during that time. You can peek into the burial itself and then learn more about the excavated artefacts at a little museum nearby. Read more on the official website (or by googling, of course). Hōryū-ji and its town are a little off the beaten path for many visitors to Japan, but totally worth the trip. In October, I visited the island of Kyushu for the first time on a family trip. Specifically, we went to Kumamoto City in Kumamoto prefecture. I’ll write about the city another time, but here, I like to write about our day trip to Mount Aso. Mount Aso is a volcano with 5 peaks and is famous for, according to a tourist website, its “ancient caldera [which] ranks among the world’s largest, with a diameter of up to 25 kilometers and a circumference of over 100 kilometers.” At the Aso volcano museum, I learned that a caldera is land that gets pushed down like a sinkhole when a volcano erupts, forming a sort of bowl shape in the landscape, with the volcano in the middle. As you might recall, Kumamoto suffered multiple large earthquakes in April 2016. The recovery is ongoing, and several of the train and bus lines are still disrupted. To get to the mountains, we took a bus ride of 90ish minutes from Kumamoto City to Aso City station, and from there, a special mountain bus for another 30 minutes to the Mount Aso visitor centre and museum. The ropeway line that allows you to see the main active volcano crater was closed after an eruption in October 2016. It reopened in March 2018 (well after our trip), but of course it is occasionally closed for safety reasons depending on volcanic activity. Although we couldn’t see the smoke-spewing crater up-close, we had a fantastic hike up one of the peaks. Rather than the type of switchback trails that I’m more used to, we climbed stairs pretty much straight up the side of the peak. From the top, we had an excellent view of the caldera, the other peaks, and the active crater. Overall, it’s a very beautiful area, and much less-visited (that is to say, not overrun with tourists) than the main hotpots of Tokyo and Kyoto. 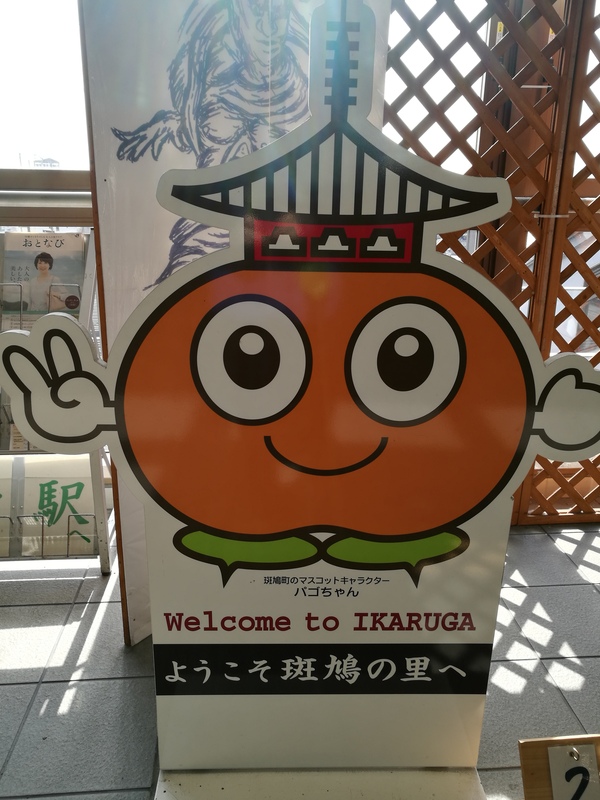 Kumamoto City is a two-hour flight or six-hour (comfy!) Shinkansen ride from the Tokyo area, and is absolutely worth a visit. The area is still suffering from the earthquakes and resultant loss of income, so visitors are most welcome. In early March last year, we visited Himeji Castle. Himeji is in Hyogo Prefecture, roughly 500 km / 300 miles west of Tokyo. 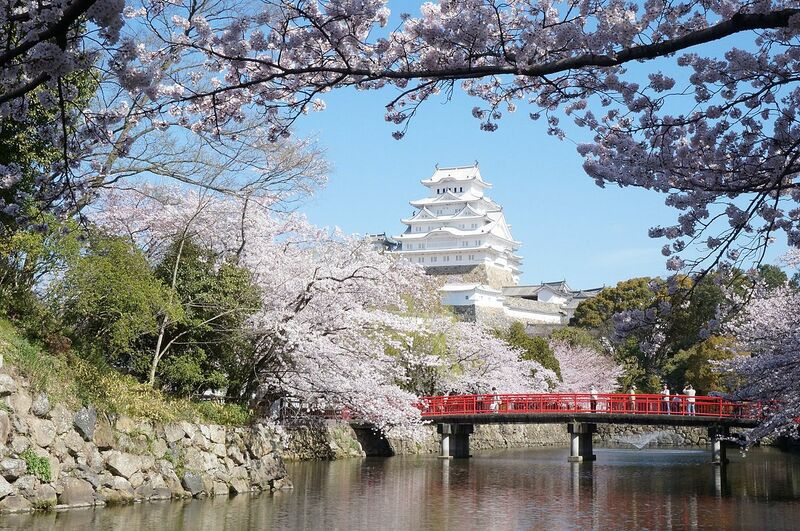 The castle is one of the very best in Japan and is registered as a UNESCO World Heritage site (one of Japan’s first). The current structure was completed in 1609, although it was a fortified stronghold from the 1300s. It has managed to survive earthquakes and bombings, with a restoration to the facade completed in 2015. The amazing white colour really sparkles in the sun, so I’m glad we got to see it post-restoration! We were there before cherry blossom season, alas. Although it would be wonderful to see the castle surrounded by pink blossoms, it also becomes a crowded madhouse, so perhaps a more relaxed visit is better. Even without being there at peak time, the queue to climb to the top of the keep was substantial. I didn’t take many pictures inside as we had to keep pace with the lines continuously trudging up the six stories. Despite the crowds, it was very cool to see the dark wood, weapons racks, and strategic windows for archery and dropping boiling oil / water on attackers. The castle is alive with numerous legends from samurai feudal days, not to mention more recent historical dramas filmed there. There’s tons to read about the castle’s history on the interwebz, but this article in the Telegraph gives a nice short introduction, plus there’s a timeline on the castle’s website, and also wikipedia, of course. We also visited Koko-en (好古園), a beautiful garden next to the castle. Highly recommended!